Fill a large bowl with ice and cold water and set aside. Place eggs in a large saucepan, add cold water to cover by 2 inches and bring to a rolling boil. Remove from heat, cover and let stand 10 minutes. Drain and transfer eggs to ice water. When eggs are cool, peel and place in another large bowl with beet and vinegar; add enough water to cover. 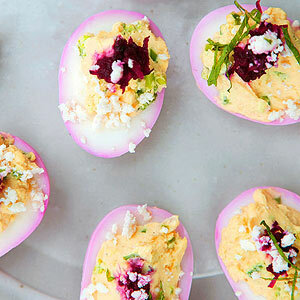 Refrigerate until eggs are stained pink, 1 hour (or up to 3 hours for a deeper pink). Dry eggs and halve lengthwise. Scoop yolks into a medium bowl. Add scallion, jalapeno, mayonnaise, mustard, salt and 1 tablespoon water and stir until smooth, thinning with additional water if necessary. Spoon yolk mixture into white egg halves. Drain beets and discard liquid; transfer to a small bowl and toss with lime juice. Top eggs with beet mixture, mint and cheese. « How good is all the new high-street fitness gear, really?